With four (or five?) floors and dozens of rooms, the building of Cathedral Prep is full of mysteries and several rooms that many students have never actually been in. Though a select few have been lucky enough to go into these rooms, it is not very common for students to see them. Past the auditorium, into the science wing, most rooms are evidently seen and used as classrooms, but what students do not see is the “hidden” room down the stairs by the 10th Street exit. If one were to go down the staircase, they would quickly meet a large door, which grants access to this room. 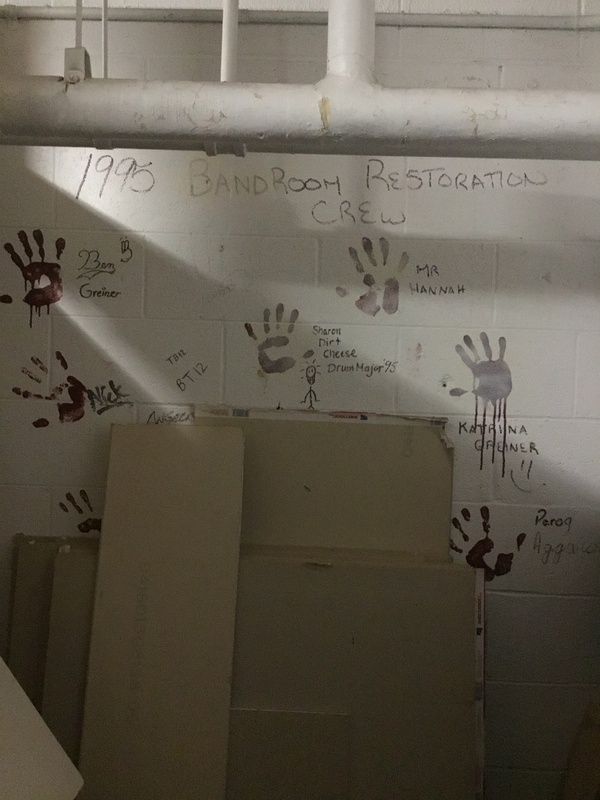 To the right of this door, there is a wall which reads “1995 Bandroom Restoration Crew” with painted handprints and signatures all around it. On the opposite side of this entrance is another door that can also grant access, through Mr. Steadman’s music room. Mainly used for storage by Mr. Steadman and Father Mike, the room is divided into two halves: one half used for instruments, the other for theater costumes. Through the auditorium from the science wing, one will be entering the first floor of the main building at Prep. Up the stairs, they then find themselves on the second floor. Right at the beginning of the wing where Miss Lion’s, Mr. Fleming’s, and Dr. McLaughlin‘s respective rooms are located, one will see two doors across the hall from each other labeled “storage room”. Overloaded with bookshelves stocked with all the yearbooks from Prep’s history and several reading materials used in English classes, these rooms are the definition of storage rooms. Virtually a miniature library for the English department, one can see the true value in what many look at as just another storage room. Returning to the stairwell once again and continuing up another floor, one will reach the third floor. Next to the ROTC classroom, in the center of the hallway on the third floor, one will find the primary teacher’s lounge. As a much larger area of space for teachers to use, this teacher’s lounge has its own sub-area upon entry of the space. In this small sub-area to the lounge, there is a printer, vending machine, and a miniature teacher-mailbox system for papers to be delivered to specific faculty members, all of which are intended for teacher-use only. Through the sub-area comes the actual lounge itself. As one of the nicer rooms in the building, students may be in awe of the primary teacher’s lounge and everything inside of it. With several cushioned chairs on wheels surrounding a regular sized, polished wooden table, and a blue velvet loveseat, this space is truly a “lounge” for the teachers. An upgraded edition of the science wing’s teacher’s lounge, the third floor lounge has a complete counter-cabinet system, with a sink, coffee maker, microwave, and mass amounts of coffee ground containers on it, and a full-size fridge. With so much space, maximum comfort, and a number of supplies, it is no wonder a few teachers may use their free period to kick back and relax on the third floor. Up the stairs once more, is the air conditioned fourth floor. Halfway down the hallway, there is a small opening with a few stairs leading up to yet another room. Through the doorway at the top of these stairs, is the room used by ROTC to store a number of racks of uniform coats and pictures of past ROTC members. With nothing exclusively special about this room, the only truly notable thing about the ROTC storage room on the fourth floor is the ceiling-tile access to the fifth floor. One of the most interesting, rarely seen areas in the building, the fifth floor is often referred to as Prep’s attic. With various ways of entry, Prep’s fifth floor is a complete mystery to those who have not truly investigated the area. Many that have passed through Prep’s hallways are completely unaware of the fifth floor even existing, let alone what it looks like. Overall, with four floors advertised and dozens of classrooms filling the hallways, there is a large amount of rooms throughout the Prep hallways that students of the past and current students have not ever been able to see or be in. With so many unknowns all over the building, who knows what things throughout Prep may be uncovered in the future.